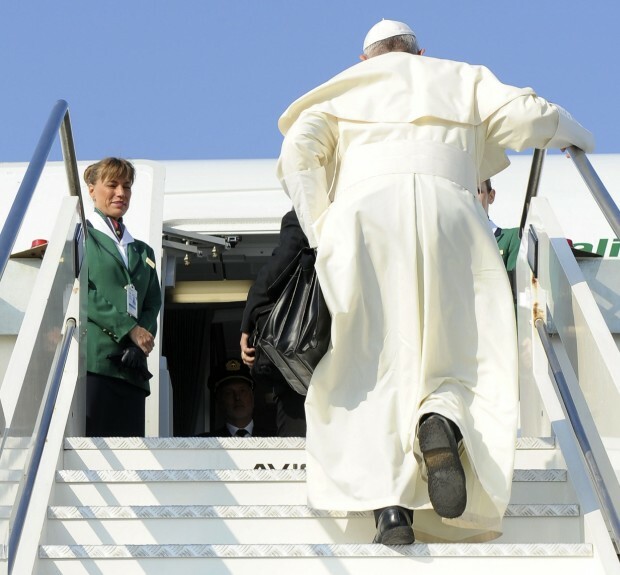 ABOARD THE PAPAL FLIGHT TO BRAZIL (CNS) — With economic hard times as an excuse not to hire young people, the world risks tossing them aside and endangers its own future, Pope Francis said. Speaking to reporters aboard the papal flight to Rio de Janeiro July 22, the pope declined to answer their questions, but instead made very brief remarks about his July 22-29 trip and then greeted each of the 71 media members. A Mexican veteran of papal trips, speaking on behalf of the journalists, welcomed the pope to the back of the plane on his first foreign trip, acknowledging the pope’s reputation for keeping reporters at a distance. While it is true that young people are the future, he said, they are not the only keys to a healthy future for a society, nation or the world. Pope Francis told reporters he knows that in many countries the economic crisis has been hardest on young people and young families. “I read last week how many of the young are without work, and I think we run the risk of creating a generation that has never worked,” he said. What the world needs and what Pope Francis had said he hoped to demonstrate in Brazil is “a culture of inclusion and encounter” to make sure everyone’s place and potential contribution to society is welcomed. World Youth Day obviously has been on the pope’s mind for weeks, but in the three days before leaving Rome it was clear the trip and the young people he would meet were a priority for him. He visited retired Pope Benedict XVI July 19, asking him to accompany the journey with his prayers. Then July 20 he made an unannounced visit to Rome’s Basilica of St. Mary Major, spending more than half an hour in private prayer and entrusting the young people to Mary. He recited the Angelus prayer at noon July 21 with visitors who were gathered in St. Peter’s Square. He thanked the people who had brought a large banner with the words “Buon viaggio” and again asked people to accompany World Youth Day with their prayers. Pope Francis’ @Pontifex Twitter account also took a decidedly WYD turn the three days before he left, telling those already in Rio he was looking forward to seeing them, praying for a safe journey for those heading toward Rio, and July 21 offering prayers that those unable to make the trip would still be a part of it through prayer.